Questions? You may contact us by email or by calling the location closest to you. The Wheelchair and Walker Rental legacy began when Frank and Julie Demock opened a small store in1972 in El Paso, Texas. Over the years, with the help of his three sons Louis, Mike and Danny, Wheelchair and Walker Rental has become a leader in the medical supply and equipment industry. Wheelchair and Walker Rental has been serving its customers in southern New Mexico and west Texas with home medical equipment, repairs and supply needs since 1972. We take extra care in making sure that we satisfy the needs of each of our customers. Informed personnel are available to answer your questions and work with your doctor and insurance company. Our staff gives each of our customers the personal attention he or she deserves and are trained to find the right products for each individual. We believe that having your medical equipment repaired should be a hassle-free experience. For over 35 years, we have built trusted customer relationships based on dependable and professional service. Wheelchair and Walker Rental is committed to earning your trust by providing you with the expertise, value and responsiveness you expect...every time you call us on all equipment to include repair whether you purchased it with us or not! We participate with most major insurance plans, are a Medicare provider, and will coordinate insurance billing for covered items. Please contact us for more insurance and coverage information. We offer a full line of home medical equipment from Oxygen to hospital beds and wheelchairs, as well as a full line of daily living aides. We have the ability to special order anything you may need that we don't stock in one of our five showroom locations. 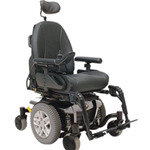 Wheelchair and Walker Rental strives to make a difference in people’s lives and in our communities.